Bambu by Sprout Social gives your employees a simple way to amplify your brand’s reach by sharing curated content across their social networks. Work for Bambu by Sprout Social? Learning about Bambu by Sprout Social? "An amazing social media employee advocacy platform developed and supported by an incredible team"
The Bambu platform offers a simple way for our team to share social media content and engage with their followers. The ease of use makes it very straightforward to onboard new users and maintain ongoing momentum internally. And best of all, the Bambu team is amazing! Every person I have engaged with has been knowledgeable and has gone out of his/her way to assist. They have ensured our success with the product. The features and functionality continue to evolve which only serves to strengthen Bambu's offering over time. The other product we evaluated had lots of bells and whistles but ultimately, we loved both the ease of use of Bambu and the team. They really helped us kick things off and remain committed to our success. Bambu enables our employees to easily get more engaged on social media and really become thought leaders in their own right. Our content is shared more frequently and new employees are asking for training and logins! "Bambu makes content sharing a breeze!" I like how easy it is to curate content. The variety of ways that we can share is also a big highlight for me. I think my favorite thing is being able to upload ReTweet links so our employees can easily share tweets with the click of a button. I wish we could share videos. I think that is really the only major content type that is not supported at this time. Bambu is very useful if you want to ensure your employees are sharing the best content from your company at any given time. I have been blown away with the superior customer service from our rep and their support team to any bugs are addressed quickly and that we have all the tools we need to make using this product a massive success for our business. Bambu has helped us connect with our employees to utilize their social networks to increase our corporate presence- all in a fun, convenient way. And fun and convenience are important when your average employee age is 24. "Bambu did more than we ever dreamed it could for our business"
Ease of use, the clean user experience, and how quickly you can roll Bambu out in an organization. I would love to see an Instagram integration. So more of a suggestion than a dislike. There is really nothing I dislike. Sign your agreement and get started with Bambu immediately! We saw an ROI in three months when comparing the price to paid social media placement with traditional native advertising outlets and PPC. Bambu allowed our sales team to become active on social media with on-brand messages. Previously they did not have the time and did not feel comfortable sharing anything on social. It also allowed us to bring in other business units and start breaking down barriers within our organization at a tactical level that we had previously been unable to do. The information sharing that is now going on between department because of Bambu is credible and the social media impression power keeps growing at a pace that is faster than we could ever have ever accomplished on our own. "Bambu: An Employee Advocacy Dream"
The Bambu platform is extremely clean and sleek. Our teams needed very minimal training to feel comfortable with the tool because it is so intuitive and easy to use. The only part of Bambu that is somewhat challenging is that it's difficult to switch between and admin role and user role. It would be great to be logged in as a manager, but be able to switch to a "member" view to see what our users see. The team at Bambu is one of the best I've encountered in the social space. I've worked with a lot of companies, but the Bambu team is responsive, helpful and knowledgeable. They also take suggestions very seriously! We've already seen updates made based off of suggestions we've made. The biggest thing we've solved is simplifying our employee engagement program. Bambu gives our employees confidence in the content they're posting and makes them feel more comfortable talking about our company on social media. "An amazing tool to enable your whole company as thought leaders." It gets our content in front of our current or potential customers by using the social media account our employees already have. Through this we increase the exposure of our curated content with every Bambu share. We would like more customized reporting so we can pull data the way we would like. Work closely with your Bambu contacts to learn tips and tricks on using the system as well as getting buy-in from leadership and employees. Bambu allows us to get our custom marketing content in front of more potential customers. It also enables our sales staff to become thought leaders in our industry without working harder to do so. We have seen massive impression increases on the 3 major social media platforms that we could not achieve with our business accounts alone. Our blog visits have also increased using Bambu due to the sharing of that content. "Bambu removes the fourth wall of social media." My favorite thing about Bambu is that it allows us to connect and share brand messages consumer to consumer through the employee advocacy platform. This capability removes the fourth wall in social media communication. While our messages remain the same, the initial touch point is more familiar. There isn't a lot that we dislike about Bambu. If there's one thing I could change it would be the ability to use custom messaging in the weekly content newsletter. Other than that, everything is seamless in the Bambu platform. Bambu is a simple way to get your employees engaged in company messaging. Likewise, it helps employees by creating tailored content to help them curate their own social platforms. With Bambu we are building trust with potential customers through our own employees. Likewise, we use the platform to help our audience reach a broader range of people and businesses. "Fantastic employee advocacy tool for engaging your team"
The User Interface is clean and simple, making it easy to use as an admin as well as a user. The platform's features are instinctive no matter what level of comfort you have with technology and social tools. I like that I can review metrics on both who's sharing and the content being shared. The single thing I'm not using much is the Facebook post direct share feature. It doesn't "look" like the Facebook post when you're reviewing the available stories list in the platform, so it's less appealing to share. We produce so much content in any given month that it's hard to share it all without constant emails to the team. So, the weekly digest coupled with the ease of sharing makes it so much easier for our team to see what's being produced. "Close but not quite there"
The concept and the pricing are both great. Having the app for the employees is also helpful. The scoring is wrong. Sincerely. It's the total number of followers multiplied by the number of posts. Given the algorithms, there's no way these numbers are correct. Ex: We had an employee get her tweet retweeted by an account with a significant number of followers but she didn't get a bump. On top of that, there's no real way for users to contribute content. Top admins have to approve what is submitted but even that has to be in a certain category. Also, everything has to be done in the app. So if your employee can't like/share/comment on a post and get points. Ask yourself what you're truly looking for. Gamification or easy access to social posts? Bambu is more so beneficial for the latter at this point. It has helped with overall audience acquisition and website traffic. This and awareness. "Bambu makes social sharing a breeze. " Bambu has been a great tool for out employees to share our social media content. Bambu is extremely easy to use and allows for our employees to find all of our content to share in one place. There is nothing to dislike about Bambu. They are a great partner to work with. If there are certain features they don't offer currently that you are looking for, most likely it will be coming in the future. They are always adding new features. Their customer support is amazing. They truly want to see you be successful and will assist in alway they can to ensure that you are. Bambu has really helped with our social media promotion and social selling. Our employees are sharing our content much more now because of how easy Bambu makes it. I love that even our least tech-savvy users are able to use Bambu easily. It allows us to share news and insights with our agents so they can share what's most relevant to their own spheres. If you can, start with Single Sign On, rather than switching to it after rollout, but the SSO is worth it. During busy market times, real estate agents don't have a lot of time to curate content to share with their spheres on social media. Bambu makes it easy for us to provide them with high-quality, locally-focused content. It allows us to support our agents' social media efforts and empowering them to be more pro-active on social media. "Simple to use yet Impressions galore"
I truly love the ease of the platform. I love that it is easy to teach to others, but that others find it easy to use. It is a simple platform that really has results. To be honest, there is very little that I dislike about this platform, everything that I didn't like or wanted to be added has been added. Make sure that you have a programme to get people involved in this before you try to get the company involved. The problems we are having is the number of people signing up to use the platform, but there are more and more signing up each day hearing about the business-wide benefits it is offering. I have realised how far and wide our articles are being spread thanks to Bambu. "Simple, platform that will move our company forward"
Bambu understands social media, and builds their product as such. I love the simplicity of the platform and how easy it was to onboard our participants. The team at Bambu was very hands on and involved and made sure to be there to support us throughout the process. I think the implementation strategy could have been defined a a little more clearly leading up to the roll-out. We have employees all over the country who are constantly asking where our content is and what stories CDK has to tell. Our sales and consulting team particularly wants to establish themselves as thought leaders but don't necessarily have the time to do it themselves, Bambu provides an easy way for them to do so. "Bambu makes employee advocacy stupid simple!" I love that you can provide suggested share text for articles curated in Bambu to make sharing as easy as a couple of clicks for staff! We've seen great participation in employee sharing with the implementation of Bambu. I wish Bambu would integrate more closely with Sprout Social. It would be nice to be able to curate articles and share text for both employees and our corporate accounts at the same time! Bambu was an easy choice. Not only is the tool well-designed and easy to use, they have phenomenal customer service and account reps that help from planning, to implementation, and even content curation services! Our staff is the most valuable resource in the company. We know word of mouth is much more effective than any advertising campaign will ever be. To be able to have our staff amplify our messages in the form of thought leadership articles, blog posts, and product and company news is invaluable! "Great platform, has increased engagement in our organization"
Bambu makes everything easy. It's easy for me to go in and add content to be shared and it's easy for participants to share that content. They also add new features at a fairly rapid pace. I wish that impressions/reach was based on actual reach and not simply the number of followers. Honestly though the things that I've disliked in the past have been resolved through updates. The team pays attention to what users are requesting and adds features. We're trying to drive employee engagement and increase reach on social media. Both of these benefits have been realized, although admittedly on a small scale since we have a small group utilizing the tool. "Great platform and great customer service"
Easy to use for administrators and end users. Bambu support takes suggestions for improvements very seriously and have been great to work with as the product is always improving. The analytics are very good and you can divide them by tags, teams, etc. They've recently added a way to share images natively for Facebook and Twitter, which is awesome. 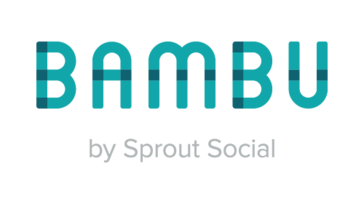 Bambu doesn't currently integrate with their social media management tool, Sprout Social. They are in the process of hopefully making this possible. We researched many employee engagement platforms and Bambu, for the price, is the best among them. We've been on the platform for about a year and a half and have added another company to the program due to the first company's success. Great group to work with. We use it to share our brand content with employees and contractors so the can easily share messaging through their own social channels. "Bamboo makes quick work of social sharing "
It would be nice to be able to post across all of the social platforms from one dialogue box/window... but I understand the limitations of the program. "Bambu is an effective way to manage your Social Media Accounts." I love the fact that with Bambu you can schedule out future posts for your accounts. This allows you to plan out your posts more thoughtfully and limits the amount of time necessary for posting. I wish that you could interact more with Instagram while using Bambu. Scheduling out my posts would be super useful. I think that Bambu does a great job of keeping up with Google's Algorithms. This, in turn, will help you build out your online presence through Social Media. Bambu helps me manage my Social Media accounts. It makes it easy to schedule out content and post across multiple platforms. My posts are also more spread out thanks to this platform. "Easy to use employee advocacy platform"
A very intuitive user interface makes it very easy to learn for widespread adoption. Integrations via Zapier are also helpful in curating content into the platform from RSS tools like Feedly. As a system admin, it would be nice to be able share stories that have been curated into the platform on your company's corporate social media page instead of your personal pages. At the moment that is not possible, which requires maintaining several different systems for social media management. Full disclosure, we do not use SproutSocial as a social media management platform. Integration between Bambu and SproutSocial is getting tighter and we may consider moving over in the near future. They are currently working in tighter integration between the flagship product (SproutSocial) and Bambu, as well as introducing more gamification features. Leveraging our employees to share approved content has yielded better results than some of the more traditional advertising we've invested in previously. The month after we implemented this platform in December of 2016 we saw a 930% increase in website traffic / month which is still trending upwards in April of 2017. "Decent tool for employee advocacy"
Its pretty easy to use and schedule social media posts to the different channels. After you've scheduled a social media post, there isn't an easy way to see which posts are scheduled for which days/times. You need to click into the scheduled post in order to view that information. Ensure that for each post, you provide a number of options that your employees can choose from. Its a little weird when everyone posts the exact same tweet. Increasing employee advocacy to help improve our social presence and brand awareness. "The best option around for building an employee advcoacy program"
The people behind Bambu, from sales to account/tech support are amazing. They've deftly handled some challenging requests from our side, and have been great communicators with our team along the way. They seem genuinely interested in partnering with us and helping us succeed. There's not much to dislike here. A year ago, their product was lacking some features that other competitors had, but they've caught up since then. Our social media presence has been transformed by Bambu. Our corporate feed is richer and more diverse, and we're pushing less corporate content as our employees take the wheel. "Great product with excellent customer support"
The product itself fills a niche need within the industry, and it's simple and intuitive for people to use. You don't need to be a social media expert to be part of an influencer program. The lack of communication options from Bambu itself. There is no way to break down who should receive a digest email on what days at what times, nor is there a way to customize or personalize newsletters. This would greatly improve the communication functionality of the tool in my opinion. We are able to connect with our internal influencers and give them a platform to engage with the outside world. Prior to using Bambu, we had no centralized system or way to connect with our many sites and socially savvy employees. "A simple, sleek Employee Advocacy tool"
I really enjoyed the UX and UI of this app; It feels intuitive and modern and I love the mobile app. Unlike GaggleAMP, which i used prior to this, these push notifs worked flawlessly and even synced with my company's slack channel. Can't beat the convenience! While this isn't the best practice, I wish there was a way to autopublish some posts to social media; sometimes its hard to get my team to follow through and this option would eliminate that. I also wish there were more detailed analytics (i.e. click throughs). Would be especially great if it had a HubSpot integration. Helped us write and distribute content to our team members to share on their personal social media accounts. "Intuitive Sharing and Scheduling Tool"
When using Bambu, I like the ability to see aggregated content from my social channels and I could then decide what I wanted to share and when. Having a digest of sorts saved me a lot of time. Overall, I did not have any issues with the platform and I enjoyed using it. I would say run a pilot with a small group of individuals to gauge user adoption before purchasing the product. We were able to get our leaders to share more content and become more comfortable with social media. We often received the response of "I don't have time" "I don't know how this works" but after a few trainings and realizing all it required was 10-20 minutes a week to develop and maintain a stronger online presence, they were in. Content is key for any organization and the SME should be the one promoting the content in the channels. "Great tool for getting your company on the same page"
A few things: I love that it is created by Sprout Social because I am a user of that as well and have had a great experience. Even though the two are not connected currently, I think it is something that can happen for the future. I also love how easy it is to use. While they offer training for your ambassadors you really don't need it! The function to create different groups to send articles to is great as well because we have a ton of people globally and it is easy to put our execs in one category and sales team in the other. I would like the ability to have your users who are not admins be able to send content to admins to curate. Working for the marketing team at an event company, we have a ton of events that we attend with different sales members at both. However, the marketing team can't be there. If our users could send the admins suggestions for posts to distribute it would be great to take it out of email and make it easy for the locals in that area to share. If you are looking to get your company involved with marketing and promotion this is the perfect tool for you. Easy to use, engaged team, and they will be able to support you in whatever way they can! We are getting our team members involved with sharing our content. Our company is known to be thought leaders in the industry and the best way to spread our message is with an active and engaged community. Bambu has helped us to get our team members on board and keep them in the loop on what content we are sharing. It also limits the fear that someone is going to push out a message that is unfavorable, because you have the ability to put a default message it. We've made some significant enhancements since the last time you spoke to us and now have a feature that we call Suggested Stories. This directly addresses a lack of functionality that you were hoping to utilize with a piece of brand advocacy software. Be sure to reach out to us again for to see this and MANY new features in action! "Great tool for the right people "
The key is to set the right expectations with your employees. If you aren't seeing the results you want it isn't because of Bambu. We no longer have to manually review and count up employee sharing. The main feature of our advocacy program is the points behind it and company morale. "Perfect Tool for Employee Advocacy"
Nothing really. It would be nice to toggle between administrator and employee more easily. We are not solving problems. Bambu has helped us engage our employees and broaden our reach on social. "Director, Talent Brand and Culture"
It's a clean, simple interface that makes it easy for experts and newer users to social to share curated content quickly. The result is a much easier way to engage and promote our brand. Nothing yet! We just launched the program internally. "Great Product for Employee Advocacy!" As difficult as it is to get employees involved, Bambu has taken things to the next level and made it easy for internal communication. There's not much to dislike! I have been extremely happy with this product, especially with the updates ever so often that are making the product better. We have been able to get more employees aware and involved with content that we are producing and are able to push out more content to our audience. I like how we have the opportunity to inform our employees on recent industry news and best practices in one place. I wish users didn't have to edit their tweets before sending, but I know that's a Twitter rule. Communication has improved because no everyone is on the same page with recent news. It's easy to use, especially from mobile. Some of the functionality of the pre-proposed responses can be wonky. It's a great product worth trying. Increase the reach of the company's content. I've not found anything yet. I have found it easy to use, mobile app works great, and so far I have no issues to report. Try it! I can't imagine that you'll be disappointed. This is a pure efficiency and time management tool. Social media outreach is vital. Bambu makes it quick and easy. "A Solid Option for Employee Advocacy"
Easy to use, nice to look at and no real paint points. The digest emails are the least user friendly of it all. But that dislike is minimal. Finding an easier way for employee advocacy. This platform offers a simple way for us to share with our followers online and cultivate content. The features and functionality continue to evolve, which is great, but also a little confusing as when you're finally used to a portion of the site, it changes. This product is so easy to use that any of our team members can step in and use the product without hesitation. It makes social sharing for those who are not used to sharing a breeze. I wish I could see everyone who shared and not just the top 5. Allowing our sales team and other employees to become thought leaders on their LinkedIn networks. This is a great software for putting out large amounts of social media in an efficient way. Love the breakdown of steps. If you don't need the steps, you still have to do them. * We monitor all Bambu by Sprout Social reviews to prevent fraudulent reviews and keep review quality high. We do not post reviews by company employees or direct competitors. Validated reviews require the user to submit a screenshot of the product containing their user ID, in order to verify a user is an actual user of the product. Hi there! Are you looking to implement a solution like Bambu by Sprout Social?